Generating clear reporting, and setting up processes to review and act on this reporting, enables you to better control your business. By monitoring performance against expectations you can quickly identify where any changes need to be made (whether to correct a problem or capitalize on an opportunity). This process also creates a solid foundation for management to be held accountable to the results. Finally, this work supports robust communications to external investors and stakeholders. Here are the key elements of reporting that will assist you in creating value by improving your company’s performance. Start with an Effective Budget. If you want to understand how you are doing against expectations, the leadership team needs to understand what those expectations are, together with the assumptions behind them. A well-prepared budget will provide this, and will support a process of monthly variance analysis that can provide a gold mine of actionable information. A comprehensive budget will include expectations not only for the P&L, but also for major balance sheet accounts and cash flow, together with selected financial and operational Key Performance Indicators (KPIs). Lacking a realistic budget (or any budget at all), the only things available to look at are comparisons to trends and/or prior periods. While these can have some value, they will usually be inadequate especially for businesses experiencing significant growth or other changes. Comparisons should be made to both budget and prior periods. Sometimes your company or your marketplace will undergo significant changes versus what was anticipated and reflected in the budget. Examples could include a competitor going out of business, greater than expected success of a new product launch, etc. In these cases, it would also make sense to update the budget with a revised forecast for the year and compare your results to that as well. Make it Easy: Line Your Monthly Reporting Up with the Way You Look at the Business. One thing that should never happen is for a report to come out that the user has to manipulate to get to numbers that he or she can understand and review. This is a waste of valuable management time. Today’s accounting packages provide a level of customizable reporting, and where needed, automated spreadsheets can be also used to present information as desired. Operational KPI’s (which vary by industry), such as customer traffic, customer conversion, warranty attachment rate, line efficiency, etc. The important thing is that you and your team determine what information you need, figure out where and how to collect it, and consolidate it into easy-to-use reporting. Make Sure the Information is Actually Put to Use. 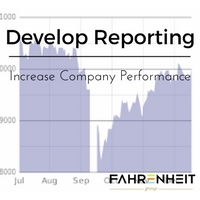 Great reporting will do nothing to increase your company’s performance if it is not utilized consistently. A good way to make sure this happens is to integrate a report review and follow-up process into your normal cadence of running the business. Here is a brief summary of best practices, which you can adjust to fit your needs. Monthly: After the books are closed (preferably within a day or two), the finance team prepares and sends the financial reports, which include comparisons to budget and prior year, to the department leaders. Each department head should work with finance and prepare comments for any significant variances during the month, along with action plans to address any issues (preferably this work should be completed within another day or two). A management meeting should be held to run through these variances and associated action plans. If everyone is prepared, the discussion can move quickly and can simply be part of a regularly-scheduled staff or leadership meeting for that week. Weekly: At the normal weekly leadership meeting, department heads should be prepared to comment on any of their areas of responsibility for which there is a variance to expectations for the prior week and what is being done about it. By handling this on an exception basis only, you can get maximum benefit in minimal time. Daily: Typically the management team will just review the numbers and have ad hoc discussions as needed. Conclusion. At first glance, the above processes could seem pretty time-consuming and bureaucratic. They do not have to be; you can do this in as much or as little detail as you need in order to understand what is going on, make decisions, and create value by better operating the business. You will most likely find that the above work actually reduces overall effort by creating a consistent and efficient means to do this. It will also provide all of the information necessary to report to investors or owners.